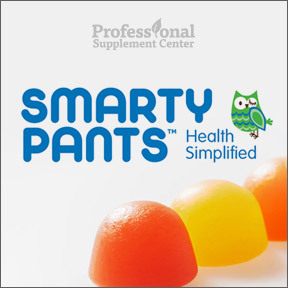 Professional Supplement Center is pleased to announce the addition of SmartyPants, a line of all-in-one gummy vitamins suitable for children and adults alike. SmartyPants supplements combine well researched and supported nutrients, multivitamins, omega-3’s, and vitamins D3 and B12 into an easy-to-take healthy and delicious formula to provide wellness support. SmartyPants vitamins are manufactured in California in a GMP certified/FDA compliant facility using only high quality, bioavailable nutrients sourced in the USA and Canada. USP certified eco-friendly fish oil is sourced from wild-caught, sustainably harvested sardine and anchovy fisheries in Peru. All ingredients are third party tested for purity, efficacy and environmental toxins. All products are gluten, dairy, iron, MSG and GMO free and contain no artificial colors, flavors, preservatives, synthetic sweeteners or high fructose corn syrup. Only certified organic cane sugar, natural flavors and food based colors are utilized in their formulas. Adult Complete – Naturally flavored orange, lemon and strawberry-banana gummies provide bioavailable forms of key vitamins and minerals, EPA and DHA omega-3 essential fatty acids and 900 IU of vitamin D3. 100% non-GMO formulation. Adult Complete Travel Packs – Each handy travel pack contains the recommended daily serving of 6 naturally flavored gummies. These good for you gumdrops make it easy to get your multi’s, omega 3’s, and vitamins D3 and B12 while you are on the go. 100% non-GMO formulation. Travel Packs are also available in children’s formula. Adult Complete + Fiber – This formula contains all the ingredients of Adult Complete with the addition of naturally sourced soluble fiber and no added sugar. This product supports wellness along with digestive health and regularity and aids in stimulating friendly, beneficial microflora. Kids Complete – This Non-GMO formula provides 4-in-1 high quality goodness without artificial ingredients or high fructose corn syrup and is specifically formulated to support children’s health with multivitamins, omega-3’s, and vitamins D3 and B12. Kids are sure to love these yummy, naturally flavored orange, lemon and cherry flavored gumdrops that offer a complete wellness formula. Kids Fiber Complete – This formula removes the added sugar and adds fiber for children who need additional fiber. One serving provides 4 g of soluble fiber to help keep kids digestive systems on track and promote overall health. Also available as Kids Fiber Complete Travel Packs for on the go families. This entry was posted in Home and tagged Adult Complete, Adult Complete + Fiber, Adult Complete Travel Packs, Kids Complete, Kids Fiber Complete, SmartyPants. Bookmark the permalink.